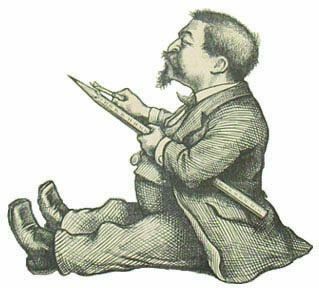 Thomas Nast (September 27, 1840–December 7, 1902) was a famous caricaturist and editorial cartoonist in the 19th century and is considered to be the father of American political cartooning. He was born in the military barracks of Landau, Germany (in the Rhine Palatinate), the son of a musician in the 9th regiment Bavarian band. His mother took him to New York in 1846. He studied art there for about a year with Alfred Fredericks and Theodore Kaufmann and at the school of the National Academy of Design. After school (at the age of 15), he started working in 1855 as a draftsman for Frank Leslies Illustrated Newspaper; three years afterwards for Harper's Weekly. He drew for Harper's Weekly from 1859 to 1860 and from 1862 until 1886. In 1860 he went to England for the New York Illustrated News to depict the prize fight between Heenan and Sayers, and then joined Garibaldi in Italy as artist for The Illustrated London News. Nast's cartoons and articles about the Garibaldi military campaign to unify Italy captured the popular imagination in the U.S. In the early 1860s, he married Sarah Edwards. His first serious work in caricature was the cartoon "Peace in 1862," directed against those in the North who opposed the prosecution of the American Civil War. This and his other cartoons during the Civil War and Reconstruction days were published in Harper's Weekly. He was known for drawing battlefields in border and southern states. These attracted great attention, and Nast was called by President Abraham Lincoln our best recruiting sergeant. Even more able were Nast's cartoons against the Tweed Ring conspiracy in New York City. His biting wit was generally focused on political corruption, and was instrumental in the downfall of Boss Tweed. It was said his caricature of Boss Tweed was used by the officials of Vigo, Spain when Tweed fled justice there. In general he was well known in his time for his political cartoons supporting American Indians, Chinese Americans and advocating abolition of slavery. His cartoons frequently had numerous sidebars and panels with intricate subplots to the main cartoon. A Sunday feature could provide hours of entertainment and highlight social causes. His signature "Tammany Tiger" has been emulated by numerous cartoonists over the years. Nast became a close friend of President Grant and the two families shared regular dinners until Grant's death. Nast encouraged the former president's efforts in writing his autobiography while battling cancer. He did some painting in oil and some book illustrations, but these were comparatively unimportant, and his fame rests on his caricatures and political cartoons, and introduced into American cartoons the practice of modernizing scenes from Shakespeare for a political purpose. Columbia, a graceful image of the Americas as a woman, usually in flowing gown and tiara, carrying a sword to defend the downtrodden. Uncle Sam, a lanky image of the United States (first drawn in the 1830s; Nast and John Tenniel added the whiskers). John Chinaman, a sympathetic image of Chinese immigrants. In 1873, 1885 and 1887 Nast toured the United States as lecturer and sketch-artist, but with the advent of new methods and younger blood his vogue decreased. After the death of Fletcher Harper, he focused on oil paintings and book illustrations. He shared political views with his friend Mark Twain and was for many years a staunch Republican; had bitterly attacked President Andrew Johnson and his Reconstruction policy; had ridiculed Horace Greeley's candidacy, and had opposed inflation of the currency, notably with his famous rag-baby cartoons, but his advocacy of civil service reform and his distrust of James G. Blaine forced him to become a Mugwump and in 1884 an open supporter of the Democrats, from which in 1892 he returned to the Republicans and the support of Benjamin Harrison. He lived for many years in Morristown, New Jersey and in 1890, he published Thomas Nast's Christmas Drawings for the Human Race. He tried to start a magazine, which failed, and in 1902 Theodore Roosevelt appointed him as United States' Consul General to Guayaquil, Ecuador in South America. During a deadly yellow fever outbreak, Nast heroically stayed to the end helping numerous diplomatic missions and businesses close to escape the contagion. At age 62, in 1902, he died of yellow fever contracted there. His body was returned to the United States where he was interred in the Woodlawn Cemetery in The Bronx, New York. This article is licensed under the GNU Free Documentation License. It uses material from the Wikipedia article "Thomas Nast".